Give your customers and supporters a leg up when it comes to packing toiletries for their next trip with this deluxe travel kit. This handsome 8.5" x 5.5" zippered 600 Denier nylon case has a rope loop and carabiner clip, so it stores almost anywhere. Choose from four vibrant case colors, and add your logo to this set to create a toiletries kit that’s ready to leave when you are. 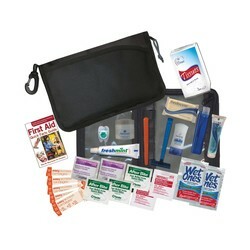 This kit includes 1 Shave Gel Tube, 1 Tissue Pack, 1 Toothpaste Tube, 1 2 Piece Travel Toothbrush, 2 Wet Ones Wipes, 1 Razor, 1 Conditioning Shampoo, 1 Emory Board, 1 Bar Soap, 1 Dental Floss, 1 Deodorant, 5 Bandages, 3 After Bite Sting Swabs, 1 First Aid Quick Facts Card, 2 Alcohol Wipes, and 2 Antiseptic Wipes. Includes a 1 color screened imprint. Setup - $60.00R per color. PMS Color Match - $25.00R per color. Additional Color Run Charge -$0.50V. Imprint Area - 5"x3". 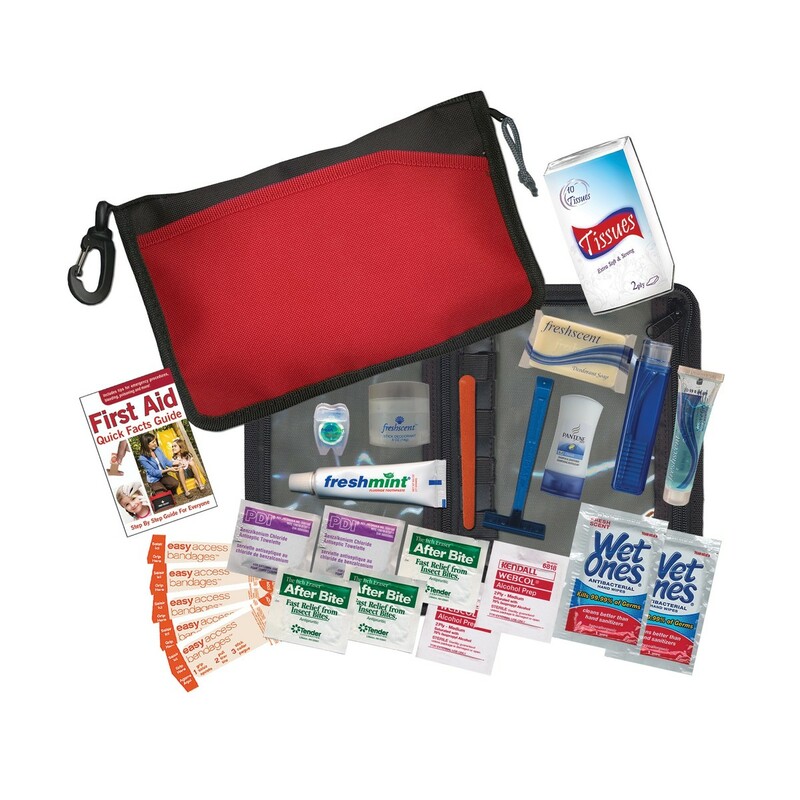 Product Colors: Black, Red, Royal, Blaze.